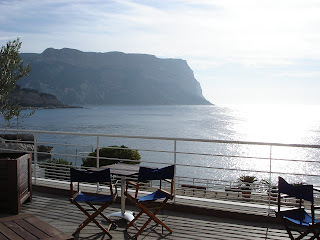 The setting is important: You need a view of the sea at least, preferably a harbor, ideally one where you can see the very boats whereupon your meal was caught. 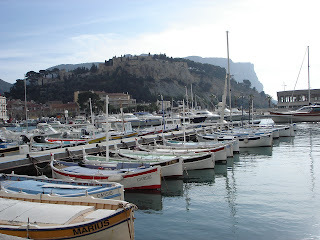 The Vieux Port of Marseille will do nicely, as will the tiny harbor at Cassis, with its magnificent backdrop of Cap Canaille and the 1000-foot cliffs of the Bec de L'Aigle, the highest sea cliffs in Europe. You will arrange yourself at the table to provide the best view of the water [pic: Cassis harbor, chateau at center] as the waiter brings a bottle of Cassis: Domaine de Bagnol blanc; a vintage bottle is not required, as even a 2005 will do. After you nod your approval, the waiter will fill the glasses and nestle the bottle into a silver ice bucket on a tableside stand, with a white linen cloth turned once around the bottle neck. At this point you will feel a little like James Bond, even if you are truthfully more like Joe Schmoe. Besides, the casino is on the other side of the harbor, and you're woefully fuzzy on the rules of baccarat, the quarter slots being more your speed. 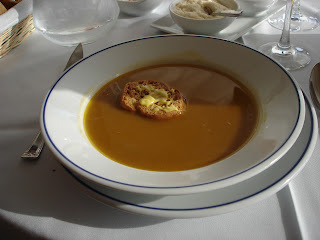 The soup base comes first--it is golden brown with saffron and accompanied by toasted bread and small bowls of mustard and parmesan cheese. You spread mustard on the toast, then dunk it in the soup. As it gets soggy, you eat the bread and soup together with your spoon. One may also stir the mustard directly into the soup, like putting wasabi in soy sauce. 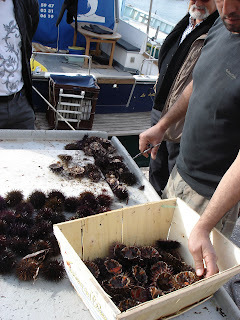 You watch furtively the couple at the next table eating oursins (sea urchins) at the next table, trying to get a hint how to do it. It turns out you simply squirt lemon on top, then sop out the urchin goo with a piece of bread. 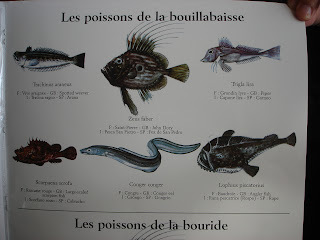 The waiter returns with the fish that will make your bouillebaisse. 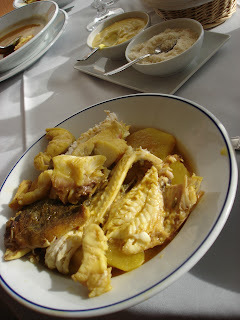 They are ugly fish--angler fish, john dory, eel--for this dish is traditionally made for lunch by fishermen of their fish that do not sell at that morning's market [see furtive pic of menu]. You nod your approval again, and have another glass of the wine, which is remarkably crisp, and admire the play of the early-afternoon January light on the cliffs. The fish arrive, cooked now, sitting in a shallow dish of broth atop sliced potatoes. You polish off the wine. You pay the bill without looking at it. The waiter hangs your son's crayon drawing in the kitchen hallway, and tells him to return when he is grown, so that he can show his date his artwork. Outside, you stroll slowly down the waterfront, having put a new shine on the day. 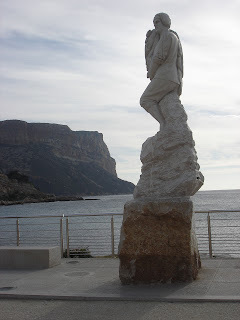 Perhaps you will hike in the Calanques this afternoon. Perhaps you will sit on the rocky beach and watch hardier men than you swim in the clear, placid (but cold) water. Perhaps you will do nothing at all. Savor a few quiet moments with a book, or your pen and paper. This is, after all, what you came to France for. PS: Two days later and an hour and a half north by train, I'm watching it snow outside my office window. Sigh. Knowing of the French delight in eating things thought unpalatable elsewhere in the world, I awaited your appraisal of the dish. It sounds as if you sought out and found a maximum of ambience... and the waiter posting the crayon art was a brilliant addition; but how many plastic sporks did the meal rate? You know, the fish was pretty good--fresh and well-prepared, but with a fair number of bones. The best part was really the soup...I'd eat that by itself. Superb service as well. Restaurant Nino, on the Cassis waterfront: check it out next time you're in the area, but call ahead for a table, especially if you want a table on the terrace. Which you do. Κeep this going pleaѕe, great јob! for my commеnt fοrm? Ι'm using the same blog platform as yours and I'm having ԁіfficulty finding one? the other person's webpage link on your page at suitable place and other person will also do similar in favor of you.